Born in Manchester, England, the son of Josephine and Jack Bailey, John’s mother had worked in Germany as a translator in the 1930s and his father qualified as a solicitor and served in the Secret Service during the Second World War. John’s secondary education was largely at the King’s School, Macclesfield from where he went to study history, finally obtaining a degree at King’s College London. Fishing – and to a degree football – dominated John’s early life. He was close to a career in professional football with trials at Stockport County and Macclesfield Town amongst others, but academic pressures curtailed this. His parents retired and moved down to Norfolk in the early 1960s and it was in this more pastoral county that the passion for football tended to give way to the joy of angling. After several careers post university, including a year worm-digging on the Norfolk coast, John completed a Post Graduate Teaching Certificate and taught first at Sprowston High School and latterly at the Norwich School, a boy’s independent establishment. He resigned from teaching in 1989. John began his writing career in 1974 with a string of articles for the Angler’s Mail. He also wrote on natural history topics for the Eastern Daily Press throughout the same period. His book career began in the late 70s when he contributed to The Big Fish Scene (edited by Frank Gutfield) an iconic book in its day. His first solo book was In Visible Waters (1984) published by the Crowood Press. John continued to write for the Crowood Press through the 80s with a string of hit titles such as In Wild Waters and Casting for Gold. In the 90s, John began to write for David and Charles, Harper Collins and, notably, Dorling Kindersley. He also worked for BBC Books, publishing Tales From The Riverbank to accompany the series of that name. In the later 90s and into the early years of this century, John worked principally with New Holland, though he published two works with The Little Egret Press. John has published in excess of forty-five angling books along with a social history book (Tales From The Country Estates) and one novel, Mossymere. His article career has continued to develop to the present day. He has had articles on fishing and aquatic affairs published in magazines and papers throughout Europe and the US. Apart from the angling press he has appeared frequently in The Guardian, the Daily Express and The Field. 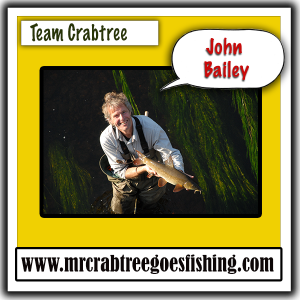 At present, John is a regular weekly columnist for the Angler’s Mail and for the Eastern Daily Press, returning to his roots, as it were. John’s photography has always accompanied his articles and his books and he has had well in excess of ten thousand photographs published throughout his career. In 1989, John left teaching in large part to appear in the ITV hour long production ‘Casting for Gold’. This was a mahseer hunt set in the Himalayas in which John appeared with co-star Paul Boote. Throughout the mid-nineties, John presented a regular aquatic slot on the BBC2 countryside programme, ‘Countryside Hour’. He has made frequent, if scattered film appearances. He appeared in Tales From The Riverbank (BBC2) and several satellite productions. In 2007, he filmed his first series with Horse and Country TV called ‘On The Fly’. This was recommissioned the next year. John has also made endless appearances on radio with, notably, an hour long Kaleidoscope Special on the life of Isaak Walton for Radio 4 in the mid 1990s. John has been guiding for twenty years. He made his name leading groups down on the River Wye for the barbel that were first appearing there. The Nineties and first years of the twenty-first century saw John lead many expeditions abroad, often to the most difficult and dangerous of locations. He has led well over twenty-five groups now to various parts of India. Other interesting journeys have included Greenland, Mongolia and Siberia with countless journeys to various different countries in Europe.